Ignition systems are repaired at Guy’s Automotive. The most common repair on the ignition system is a tune up. 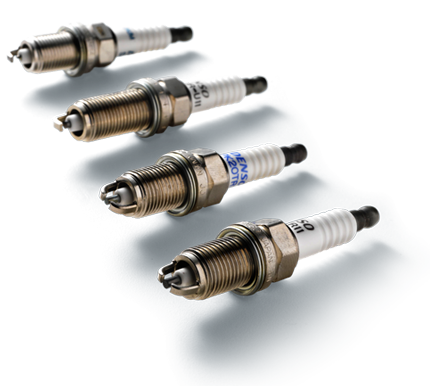 A tune-up usually consists of OEM spark plugs, but may need spark plug wires or boots, and if applicable a distributor cap and rotor. The ignition system is divided into 2 systems called the primary ignition and the secondary ignition. The primary ignition has parts like a distributor on older cars. Newer cars have parts like a crank sensor, cam sensor, module or engine computer, and a knock sensor. Most pre 1978 cars usually have points and condenser inside the distributor and should be changed frequently. When you have an ignition problem, you may experience symptoms like the engine running rough, stumbling, low power or no start. To prevent problems, have your tune ups done on your maintenance schedule and if you suspect a problem, call Guy’s Automotive and schedule an appointment to get your ignition system checked and fixed/ repaired/ or replaced. At Guy’s Automotive, we can check your maintenance schedule and let you know when your tune-up is due. If in doubt, call us and give us your car’s year, make, model, engine size and current mileage. We can let you know what and when it is due. Our tune-ups are done right with quality parts and will last as long or longer than the recommended maintenance schedule.